Crystal Palace are "surprised and disappointed" that the club's FA Cup third-round tie at Brighton has been scheduled to kick off at 7:45pm on Monday January 8 after being selected for live television coverage. The recent Premier League fixture between the two rivals on Tuesday November 28 was marred by crowd trouble as some fans without tickets tried to force their way into the Amex Stadium. There were also disturbances at Brighton railway station. On Thursday, Sussex Police apologised for wrongly claiming discarded weapons had been found at the stadium. The match was selected for live broadcast on BT Sport in the Monday evening slot, despite reservations over the potential for further issues. Planned rail engineering works also made it difficult to clear an afternoon kick-off over the FA Cup third-round weekend. 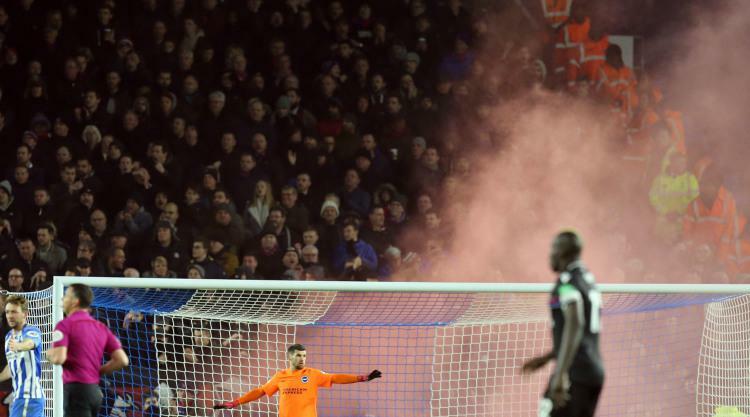 Palace have also complained about a reduced ticket allocation of 2,000 when the south London club "should be entitled to more than 4,600 tickets under normal FA Cup rules". Sussex Police have started planning for the high-profile FA Cup fixture, at which v ideo assistant referees will be trialled for the first time in competitive action in England. All parties are keen to avoid the prospect of any more disturbances, with s ix people - including one 15-year-old boy - having been arrested at the Premier League match, while two stewards - one from each club - had to be taken to hospital, one with three fractured ribs. Some supporters who held tickets were unable to get inside the ground. The date of the FA Cup tie was set following liaison through the safety advisory group, which includes the home club Brighton, Sussex Police, other emergency services and also transport providers. In a statement on Friday afternoon, Sussex Police confirmed the "preference for this fixture was a lunchtime kick-off over the weekend". However, that was not possible because of the rail engineering works and so travelling Palace fans could not use a special train service "which worked well before and helps with the smooth access and egress of supporters to and from the stadium." Palace, though, said in a strongly-worded club statement they had offered to put on free coaches to "negate this issue" and also set designated drop off and pick up points. The Palace statement added: " We strongly believe that the very small minority who misbehave and create disorder should be punished to the full extent of the law, thereby deterring others. "Instead, it's our view that the many decent and law-abiding supporters are being punished by being deprived of the opportunity to enjoy supporting their team." Palace said the club had "raised concerns" over the scheduling of the Premier League match at night, and in light of the events last month assumed that "good sense would prevail" with an earlier kick-off slot for the FA Cup tie. "We completely understand the security concerns around this match and the safety of all supporters must be paramount," the club statement added. "It's for that very reason that we felt the best and most obvious solution, as is the case with most other big, highly-charged derby games, would have been a lunchtime kick-off, combined with a bigger ticket allocation to cater for the overwhelming demand from our supporters, many of whom will again be left disappointed." Sussex Police said the ticket allocation was a decision "made with the support of the safety advisory group" and that " fans who are unable to obtain tickets will still be able to see the game live on television". The statement concluded: "W e are now working with everyone involved to focus on a safe and enjoyable match for everybody attending."